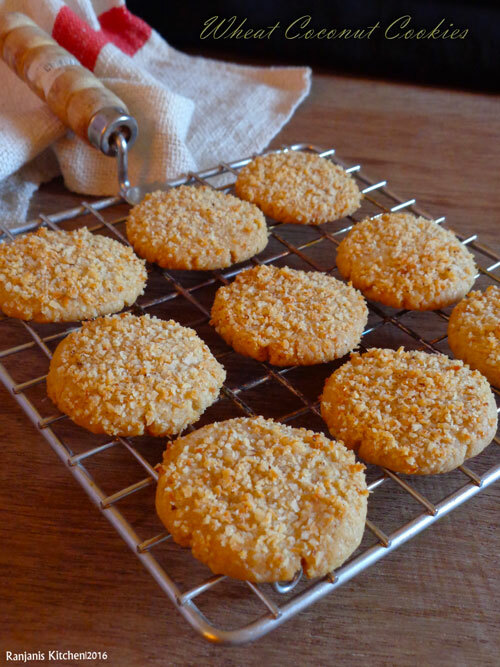 Wheat coconut cookies – crispy and chewy cookies recipe.Perfect snacks recipe to serve with tea. Its healthy too as it is made with wheat flour. 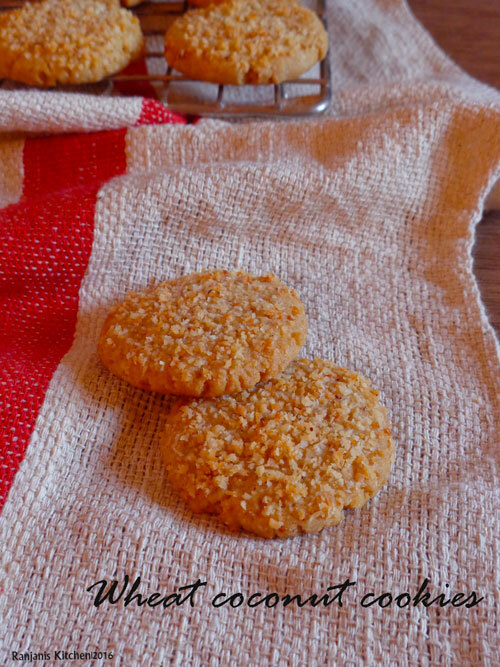 I used to made this eggless coconut cookies frequently as it is easy and handy to make with simple ingredients. The chewy taste of this desiccated coconut will not allow you to stop in one cookie.It just melts in your mouth and tempting to eat more 🙂 . We can store these cookies in airtight container for more than a week. I can say its perfect to pack as gift for friends and relatives. Pre-heat oven to 180 degrees. Grease cookie tray with butter and keep aside. In a mixing bowl, add sugar and softened butter, whisk till it becomes creamy. Add desiccated coconut and wheat flour and knead to form a soft dough. Add milk little by little if needed. Make equal sized balls on the dough, flatten them using palms. Dip one side on desiccated coconut which we left for topping. Do the same for remaining dough and arrange in greased plate with 1 inch gap for every cookie. Bake in pre-heated oven for 15 mins to 18 mins. Transfer the cookies to wire rack and cool completely before serving. 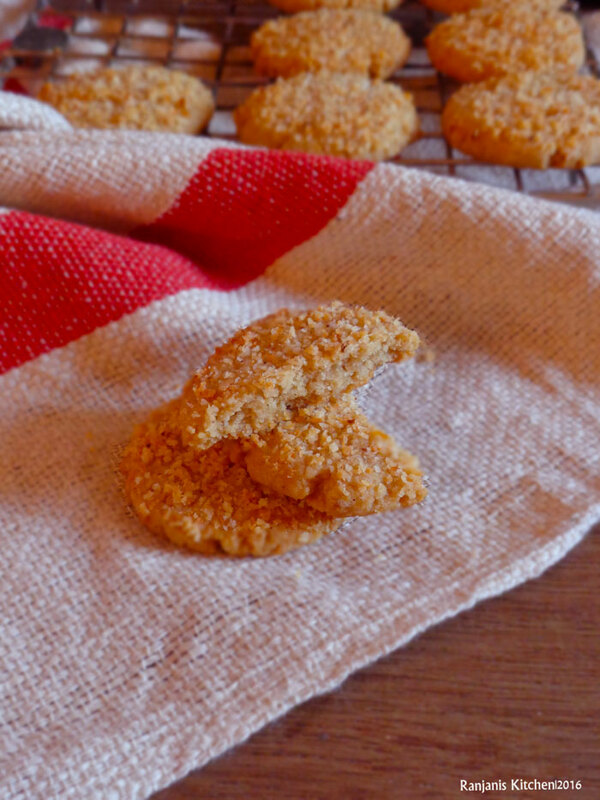 Cookies will be soft when hot, it will become firm after it completely cooled down. Adjust the sugar as of your taste. Cookies will expand while baking. So keep 1 inch space on every cookies. If you refrigerate the dough before making, it will not change in size. You can avoid coconut toppings if you don’t want. I used samsung convection oven which is good for baking, grill and microwave cooking. Click here to buy samsung convection oven with offered price. Check out eggless recipes here. 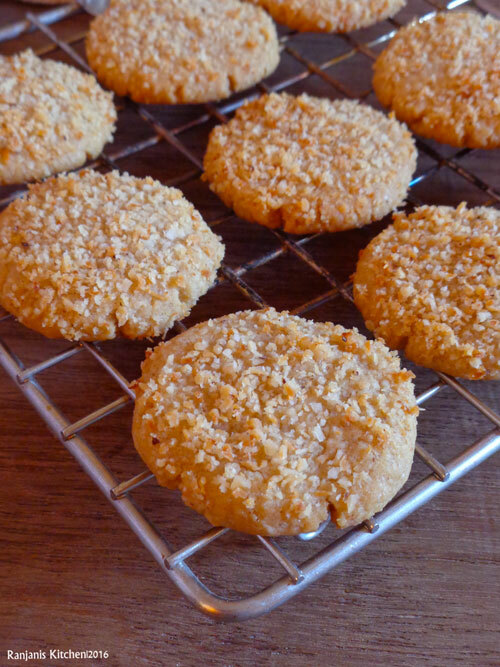 Adding coconut gives a fabulous taste to this cookies. I want some now..